FishHunters, originally uploaded by sammo371. 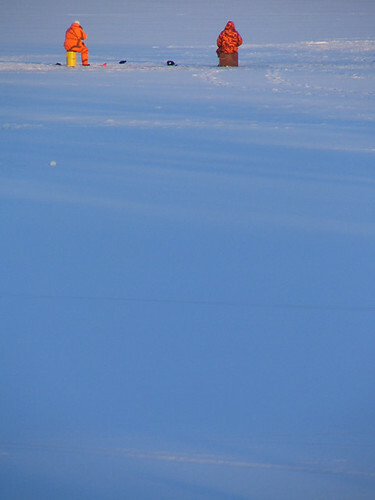 Took this photo of ice fishermen on Sunset Lake. Apparantly fish can't see hunter orange either. I've realized something lately. I typically think something is stupid and worthless only if I fail to understand it. I don't understand a lot of things. Consequently I think a lot of things are stupid and worthless. Astronomy, mathematics (beyond adding and subtracting), IRA accounts, hedge funds to name a few. In this case ice fishing is also one of those things. I don't understand why someone would willingly walk on unstable ice to sit in the middle of a cold lake and try to catch a fish whose winter metabolism probably equals that of a phone jack. This seems to be stupid and worthless to me. I used to think that way about tennis until I figured out how the scoring works. (That whole deuce thing threw me for a long time.) Now I like tennis. Yes, I know a strong case can be made that tennis really is stupid and worthless too. But I feel a sense of accomplishement figuring out the scoring without someone explaining it to me. So I'll argue that it's not stupid and worthless...although it probably is. Anyway, being a sensitive person I know it's not right to paint ice fishermen with such a broad narrow minded brush. Maybe I should try to understand ice fishing in order to appreciate it. Tonight I may eat my frozen Gorton Fish Sticks on the porch. EXTREMELY cool Exessive negative space. Dude, Ice Fishing is stoopid- I can say this, it's one of the reasons I escaped michigan. Love yer commentary though-Keep it up.